Kinesio Taping has become the gold standard of therapeutic rehabilitative taping. This specific technique involves taping over and around muscles in a systematic way to support or to prevent over-contraction and activate the body’s own healing process by activation of the neurological and circulatory systems. It is most commonly used in the acute stage of rehabilitation for treatment of muscular disorders and lymphedema reduction. 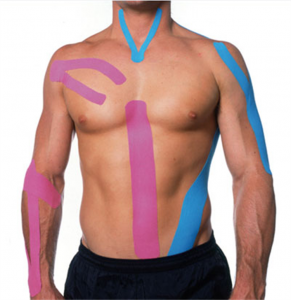 This method of taping uses a uniquely designed and patented tape to give the patient support while maintaining full range of motion. Dr. Yin has personally witnessed the dramatic healing benefits of applying Kinesio Tape to acute sprains/strains and areas of extensive muscle trauma and is trained in the strict applications of this taping procedure.